With Smart Service mechanical contractor dispatch software, your company can easily schedule, dispatch, manage, and track work orders in a user-friendly program. Because Smart Service is a QuickBooks add-on, your dispatch operations are streamlined with the customer data you already have. With our mobile app your technicians will have all the customer information they need (address, work history, job notes) to get the work done. Smart Service turns something that used to be a hassle into an intuitive process with almost no effort on your part. One of the most important aspects of mechanical contractor dispatching is routing and staying in touch with your technicians throughout the day. Smart Service allows you to see the latest changes and schedules of all technicians when you pull up the scheduling page. Fitting a new (or emergency) customer in is as easy as finding an open spot. If you want to choose the closest technician you can even color code the jobs by zip code with a few clicks. You can even use a GPS feature to track your technicians throughout the day. Are they stuck in traffic? Ahead of schedule? You’ll know ASAP. 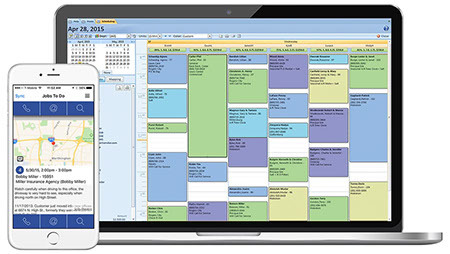 Smart Service mechanical contractor dispatch software operates in a way that fits your business, it keeps the chaos out of unexpected schedule and routing changes. Scheduling is only part of an effective dispatching process. Making sure your technicians have all the customer and equipment information is just as important. The Smart Service mobile app links you to your technicians in a more streamlined way. When they open or refresh the app, they’ll see any new changes or information that you’ve added to their job. They are also able to look at all previous job history for their current customers, including equipment details, pictures, and additional notes. Technicians can add new information while on the job as well. With Smart Service, your customer history stays accurate, current, and available in the easiest ways. Paperwork be gone! Get the Smart Service mobile app. Filing is now at your technicians’ fingertips. Smart Service mechanical contractor software uses the mobile app to extend your company’s reach to the field. On any smartphone or tablet your technicians can have access to any forms that you use to collect data and signatures while on the job. Digital (and legible) completed forms automatically sync with Smart Service, which then syncs with QuickBooks. That daily headache of sorting, double checking, and scanning (or filing) your forms is suddenly gone. In a single year, our app saved customers over a million dollars in paper costs by digitizing all essential forms! Change the way you deal with forms and communicate with your technicians. Request a free demo of our mechanical contractor dispatch software and see for yourself how it can change your business operations. Do business smarter with some of these tips!